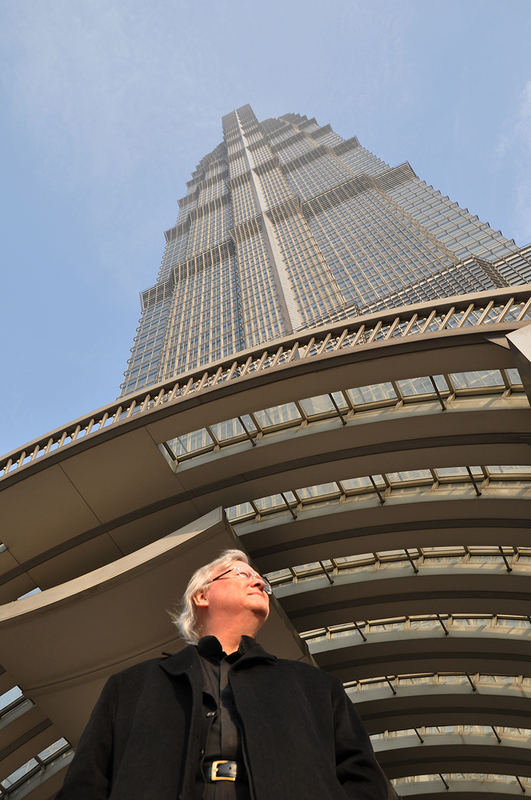 CHICAGO, November 2, 2016 – As Shanghai’s Jin Mao Tower approaches its 20th anniversary, Adrian D. Smith, Design Partner for the project at SOM in Chicago, reflects on the legacy of China’s – and his own – first supertall tower. Jin Mao Tower’s recent accomplishments and designations support the building’s reputation as one of the most treasured buildings in China. The question may sound odd coming from the current leading expert on supertall towers, but in 1993 Smith had yet to design a supertall tower, which is defined as being a building over 300 meters tall. “The client told us that they wanted an 88-story tower 4 because eight is the luckiest number in China; the pronunciation of the word for ‘eight’ sounds very much like the pronunciation of the word for ‘prosperity’ in Chinese,” says Smith. The client also expressed an alternate reason for the 88-story project. In 1988, Chinese statesman Deng Xiaoping stood on the Jin Mao Tower site in the Pudong District – when he was 88 years old – and declared it to be the location of the future of Chinese business and commerce. Compared with the density of the Pudong District of 2016, it is hard to imagine the landscape as it was in the late 1980s and early 1990s: no tall buildings, with industrial shipyards and wharfs dominating the landscape. Topped in August 1998, Jin Mao Tower has received numerous awards and recognitions since its inception. In 2013, Jin Mao became the tallest and longest-operating building in China to receive a LEED-EB: OM (Existing Buildings: Operations + Management) Gold certification. Jin Mao’s top conservation strategies have included reusing or recycling 70% of all durable goods and the diversion of 70% of the waste accumulated from facility alterations and additions. Partially due to this certification, in 2014, Jin Mao Tower was the finalist for the CTBUH Performance Award. The building maintains its commitment to ongoing key performance indicators through energy-consumption analysis meetings, which are held each month by building facility managers to clarify energy expenditures of water, electricity, and natural gas. By comparing annual and monthly consumption statistics with the building’s automation system’s daily control log, they decide where energy-saving strategies should be implemented. Most recently, in 2016, Jin Mao Tower was honored as one of the 98 architectural masterpieces in China that was designated a National Heritage site. This heritage designation list was the first to include 20th-Century architecture. Additionally, Jin Mao Tower received the 2016 CITAB-CTBUH China Tall Building Legacy Award, which recognizes the proven value and performance of buildings over 10 years old. Jin Mao Tower has also become deeply rooted in Shanghai’s pop culture. It is a well-known site for adrenaline fanatics who have done everything from climb the tower with no ropes to BASE jump with several people at a time. In an effort to help the public experience the dazzling building, on July 28, 2016 Jin Mao Tower opened an official skywalk along the outside of the 88th floor. It is the highest exterior, fenceless, transparent walkway on a high-rise building in the world, rising 340 meters above the ground. Adrian Smith, FAIA, RIBA, HON D.LITT, is an Architect of international renown, having designed many landmark buildings including the two world’s tallest structures – Burj Khalifa completed in 2010 in Dubai, and Jeddah Tower, now under construction in Jeddah, Saudi Arabia. In 2006, he founded Adrian Smith + Gordon Gill Architecture (AS+GG), a firm dedicated to the design of high-performance, energy-efficient and sustainable architecture on an international scale. Prior to AS+GG, he was a Design Partner in the Chicago office of Skidmore, Owings & Merrill LLP, from 1980 to 2003 and a Consulting Design Partner from 2003 to 2006. His work embraces the principle of “On Site” power generation using the building’s design to harvest power from the sun, wind, and geothermal conditions in order to reduce the buildings reliance on the local infrastructure. In many instances, this has had a dramatic impact on the expression of the Architecture and has added an important influence to his philosophy of Global Contextualism. Jin Mao Tower is a 280,000 sm mixed-use building in Shanghai, China. It houses a 555-room Grand Hyatt Hotel in the top 38 stories with impressive views of the city and the surrounding region. Office floors are in the lower 50 stories. Jin Mao’s six-story podium has hotel function areas, a conference and exhibition center, a cinema auditorium, and a 21,000 sm retail galleria. The base of the tower is surrounded by a landscaped plaza with a reflecting pool and seating, offering visitors a peaceful retreat from Shanghai’s busy street activity.